Residents of Russia's capital city were astonished last Wednesday when they witnessed a startlingly strange formation hovering high in the sky. Looking something like an enormous interstellar portal, the bright-white circle reminded many of Moscow's citizens of a scene from the movie Independence Day . Video of the phenomenon has since hit the Internet and has millions bandying explanations, which naturally cover such topics as aliens, UFOs and the impending 2012 apocalypse. In reality, the abnormality is probably just a rare meteorological curiosity known as a "hole punch cloud" or "fallstreak hole." Nevertheless, the enormous object is eerily reminiscent of Arizona's unexplained Ring of Mystery, which appeared above Flagstaff in 1963. 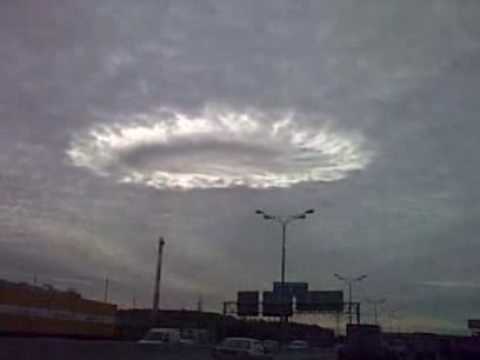 New York Daily News - Halo Cloud Over Moscow: UFO or Natural Beauty? Eating while driving. I do it. We all do it. When you're trying to beat the sunset to the world's largest scale model of the Hubble Telescope and you haven't eaten anything since that half-frozen muffin from Super 8's continental breakfast, it's unavoidable. And we've come to learn that some foods work better than others. Milkshakes, mini hamburgers, Pringles: nice and convenient. Enchiladas: not so much. Though, really, it should be pretty obvious which foods work and which ones don't. Nevertheless, Insurance.com has felt it necessary to publish their list of the top 10 foods to avoid while driving. At number 6: ribs. Really? Someone needs to be reminded not to eat ribs behind the wheel? At the other end of the spectrum: soda. If there's one ingestible that should always be OK, it's soda. Insurance.com's reason to put it on the no-no list? "Fizz in the nose." How would you improve the list? Coffee. Even with a travel lid, hot coffee can find its way out of the opening when you hit a bump. Who doesn't love the Wienermobile? The analogous, frankfurter-shaped vehicles have been an ongoing Oscar Mayer tradition since 1936 and never fail to gather a crowd wherever they stop. Unfortunately, the crowd that gathered last Friday in Racine, Wisconsin, weren't so much interested in getting their hands on the collectible Wienerwhistles passed out by the sausage wagon's drivers, but rather to get a unique peek at what is probably the most serious auto accident to involve a Wienermobile in its more than 70-year history. While looking into the recent news that states are starting to shut down many roadside rest areas, I came across a site that once again proves just how wonderful the Internet is: Restareahistory.org, a comprehensive guide on highway rest stops and picnic shelters. The site, developed by architectural and cultural historian Joanna Dowling, offers what is probably more than you ever thought you'd want to know about safety rest areas. Dowling has collected photos both recent and historic from across the United States, as well as information on architectural elements, planning, development and preservation, along with links to rest-area-related news items and departments of transportation. Any serious detourist knows it's crucial to take frequent breaks when covering long distances. Even if it's just 5 minutes to stretch your legs and grab a sack of peanut M&Ms from a caged snack machine, a pit stop helps avoid fatigue and possible accidents on the road. Unfortunately, recent reports indicate that several states are shutting down many of their highway rest areas. According to The Wall Street Journal , departments of transportation are beginning to see their rest stops as obsolete and have begun barricading exits. Louisiana has closed 24 of its 34 rest areas since 2000, four of them last year. Maine, Vermont and Colorado have recently announced plans to shutter more rest areas because of cash constraints. Rhode Island, Tennessee, Arizona and others are thinking of doing likewise. Consumer Reports: No Rest Stops for the Weary? This just in: the fantastical Googie sign that was rescued from the now-defunct Sigel's liquor store in Dallas will finally be christened at its new location tomorrow morning. The sign, which was built in 1953 and stood at the corner of Inwood and Lemmon until just a few weeks ago, was installed at another Sigel's location in Addison, at 15003 Inwood Road, last month. And though its bubbly neon circles and fantastic sputnik topper have already been shining for a few weeks now, Sigel's will officially christen the sign tomorrow at 9:30 a.m.
Just don't get between me and the Jack Daniel's display.